I’ve been spending a lot more time in grocery stores lately and I’m definitely loving the fact that beautiful, fresh berries are back in stock. In my mind, fresh berries are a sure sign that the seasons are changing, even if it’s still sweatshirt/sweater weather here in Ohio. And while peak strawberry season hasn’t quite hit my region, this recipe allows even pre-season berries to sing. Along with Spring warmth and sunshine comes bathing suit season – did that just make you wince a little? I pretty much find myself dreading the mere thought of it! 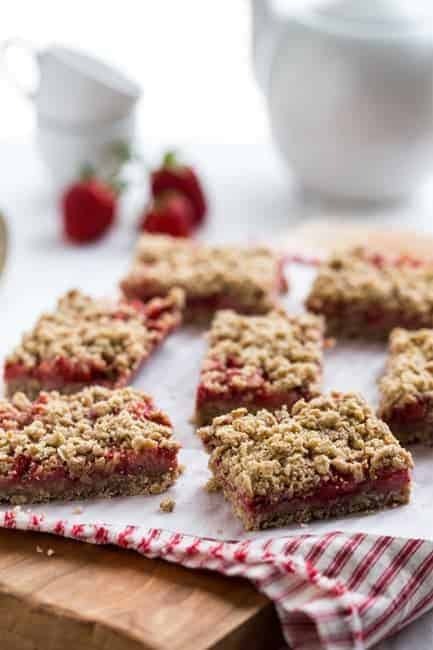 Coming off of a super long, cold winter hunkered down over delicious comfort foods; these Strawberry Oatmeal Bars sweetened with Truvia Baking Blend can make you feel a little less intimidated by a trip to the beach. Swapping Truvia Baking Blend for regular sugar has allowed me to cut some calories from my diet, without having to cut out my weekly baking rituals. These bars are a breeze to make. One simple mixture packed full of whole grain goodness makes up both the tender crust and the cinnamon crumble topping. The fresh strawberry filling adds just the right amount of sweetness to make these bars the perfect Spring dessert. Between the fruit and the oats, they’re also pretty much breakfast perfection. 1. Preheat oven to 325 degrees. Grease a 9×13 baking pan and set aside. 2. In a large bowl, stir together strawberries and 1/3 cup of Truvia Baking Blend and let sit for 10 minutes. After 10 minutes, add lemon juice and cornstarch and stir to combine. 3. In the bowl of a stand mixer, mix oats, flours, cinnamon, butter, salt, vanilla and 1/3 cup Truvia Baking Blend on low speed until combined. Scrape down the sides of the bowl and mix on high speed for an additional 2 minutes. 4. Press 2/3 of the crust mixture into the bottom of the prepared baking dish. Spread the strawberry filling evenly over the top of the crust. Sprinkle the remaining crust mixture over the top of the strawberry filling, creating a crumb-like topping. 5. Bake bars for 35-40 minutes or until golden brown. Allow to cool completely before cutting. – You can use all purpose flour in place of the white whole wheat flour. – Try swapping out other berries in place of the strawberries for a different twist. – If you would like to use granulated sugar in place of the Truvia Baking Blend, simply double the measurement. Disclosure: My Baking Addiction has teamed up with Truvia to develop recipes using Truvia® Baking Blend. This is a sponsored post written as part of that program. All opinions about Truvia Baking Blend are my own. I’ve had strawberry fever lately, so these bars look terrific. Can’t wait to try them out! 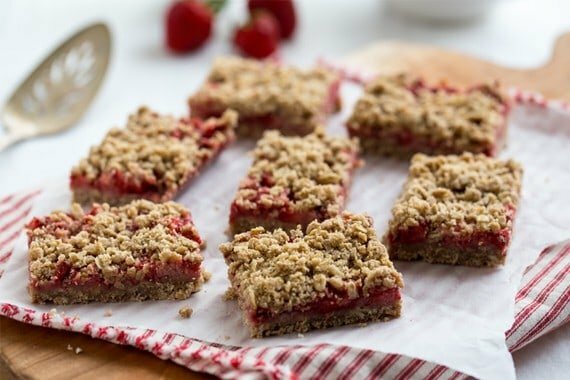 These are seriously gorgeous strawberry bars! Love the freshness, along with the oats! Absolutely lovely! I want a piece so bad right now. I’m in strawberry heaven currently. I have blackberries in the fridge – I may try these with blackberries. They are making my mouth water! These look great! I have so many strawberries to use- need to make this with them! Hope you get some warmer weather over there soon! Can’t wait for Strawberry Season to hit my area! Ohhh I love Truvia! I haven’t tried their baking blend yet! Maybe you had a brainfart like I did and used 3/4 stick of butter instead of 3/4 cup. I kept thinking it was too dry, but couldn’t figure out why! All those beautiful strawberries wasted- ughhhh! I’m so excited for the start of berry season! These look like the perfect way to celebrate it. Pinned! I can smell the strawberry from here. Looks great! Yum!!! Sounds great :) Love the strawberry combo. Mmm these look perfect! Yum! I’m loving strawberries lately! Ant those bars look absolutely delicious!! I’ve just discovered your blog and since I love berries this recipe will surely be one of my future trials…happy Sunday from sunny Italy! These look amazing! Definitely a great breakfast on the go! I baked these for a work brunch the other day. They were delicious! That’s great! I’m so happy to hear that you loved the recipe. Thank you so much for stopping back and for following MBA! I’m so excited that we just started getting fresh, local strawberries here. These bars are a must-make! Looks delicious! Can they be frozen? These should be fine to freeze. Just make sure they’re in an airtight container. I would probably put wax paper between layers of them. Any idea on the calories per piece?